The AR3200 provides 24GE interface cards to implement highdensity GE access. This interface card facilitates network operation and maintenance and protects customers’ investment. 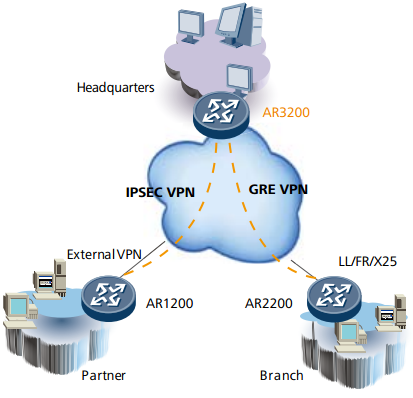 As a voice gateway for enterprise networks, the AR3200 can function as an IP PBX or SIP gateway. The AR routers have built-in PBX, which supports the enterprise main number, IVR, and bill query functions to enhance corporate image and improve enterprise communication efficiency. The AR3200 is located in the headquarters to provide the intelligent dialing function. 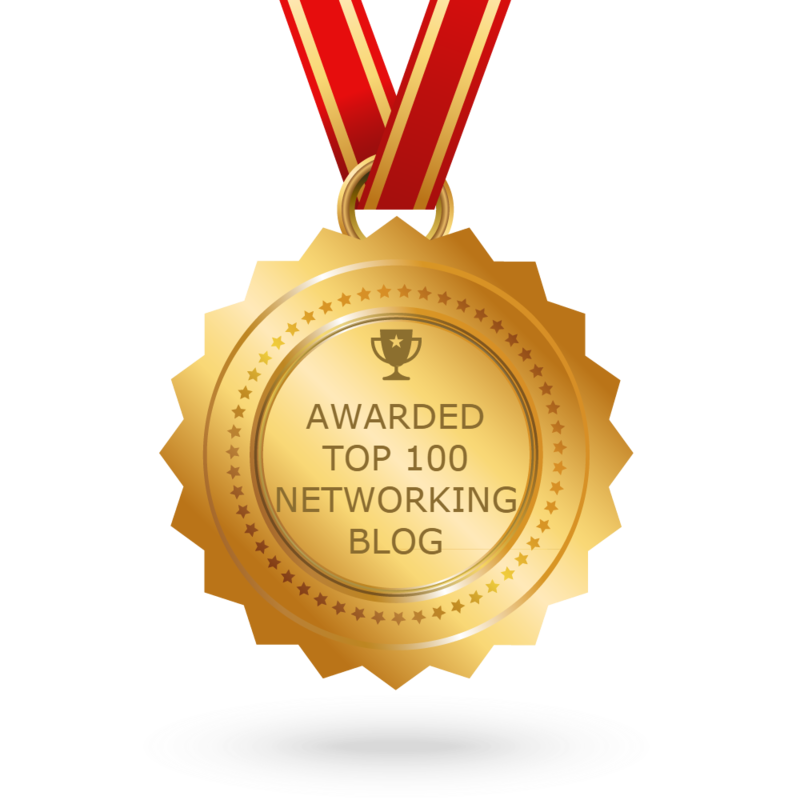 When a fault occurs on the WAN, the PSTN network is used as a backup for calls. This ensures reliability of communication between the headquarters and branches. The AR3200 integrates voice, fax, and IP services. When providing voice services for enterprise users, the AR3200 functions as the SIP access gateway of a branch to transform phone signals into VoIP signals. 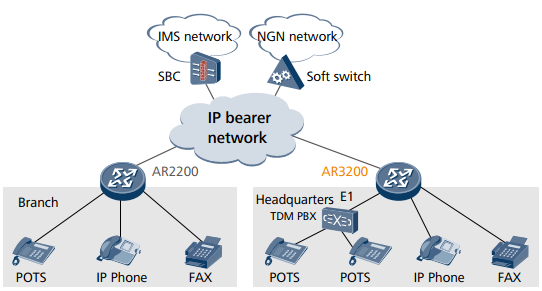 The AR3200 uplink interfaces are connected to the IMS/ NGN network to allow any media including phones, handsets, and computers to communicate at any time. The AR3200 routers integrate AC (Access Controller) functionality, which can manage the wireless AP (Access Point) in wireless LAN. AR2200 supports rich certification and flexible user access control, which can provide security access guarantee for Wi-Fi users. The rich wireless capabilities integrated in one device, this can realize centralized management of wired and wireless networks, to meet the requirements of different scale enterprises networks. The AR3200 provides various secure access functions to implement communication between enterprise branches and between branches and the headquarters, and to enable partners to access enterprise resources. Tunnels such as GRE VPN and IPSEC VPN are set up between the headquarters and branches to implement secure data access and transmission. 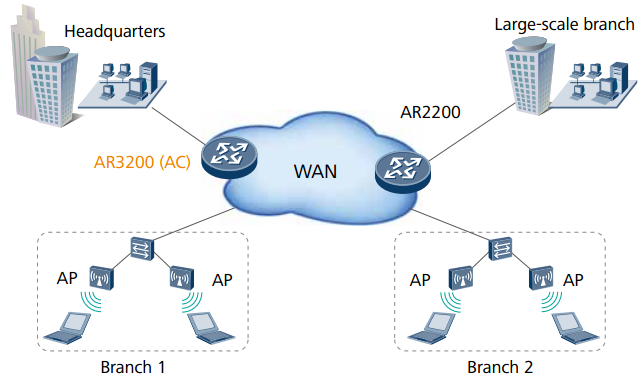 The AR3200 implements fast tunnel deployment and authentication for branches. Using a tunnel, partners can access and share enterprise resources. The AR3200 provides authentication and authorization for users. 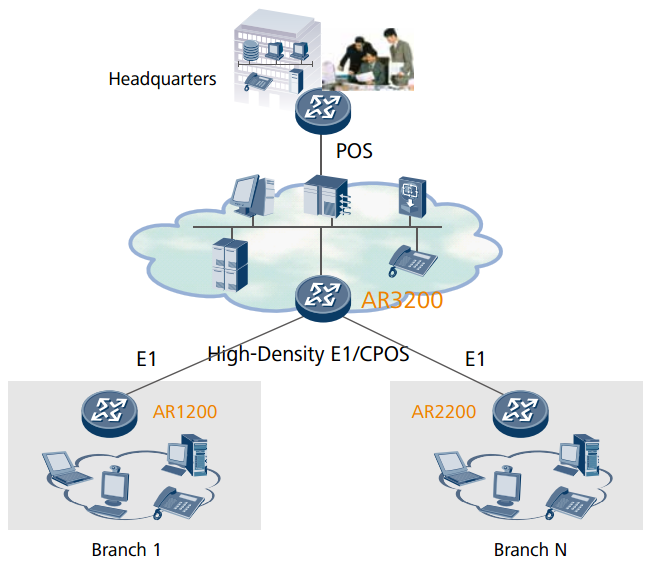 As the PEs of an MPLS network, the AR3200s are located in the enterprise headquarters and branches. Different types of services are separated by MPLS L3 VPN. The AR3200 implements flexible deployment, fast distribution, and secure transmission of VPN services, and supports enterprise service operation over networks. AR3200 series enterprise routers support the rich interface cards, including high-density E1, CPOS, POS interface cards and so on, to meet the convergence access requirements in the various branches and headquarters. Multiple enterprise small branches connected by E1 uplink to the aggregation layer routers. The aggregation routers use high-density the E1 boards or CPOS to converged access, and then through the POS uplink to connect the high-end router of the core network.